Want to keep track using a progress bar? 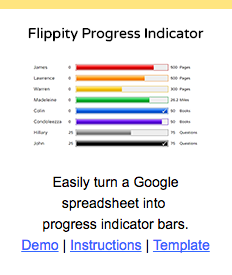 Try Flippity.net's progress indicator bar. Flippity.net's progress indicator bar is a great way to see where everyone is in relation to a goal that has been predetermined. Embedded below is a 1 minute and 47 second video tutorial on how to use Flippity to create progress indicator bars.